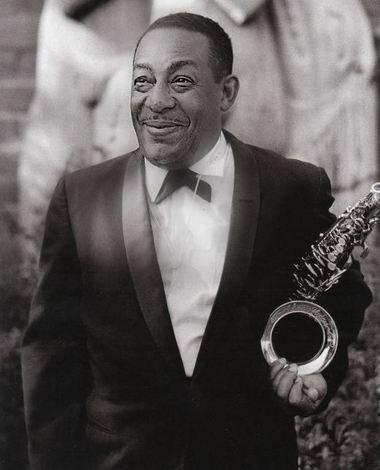 The video below is about the horn played by the great Duke Ellington alto saxophonist Johnny Hodges (1906-1970). The voice in the commentary is that of Frank Wess, a major saxophonist of the generation following Hodges who is an active player at the age of 91. Mr. Wess explains that he owns the Vito saxophone, number 5000, and used it when he played lead alto for the Toshiko Akiyoshi orchestra. You needn’t be a saxophonist to appreciate the intricacy and beauty of the instrument. Tomoji Hirikata, a senior technical specialist in New York for the Yamaha instrument company, created something approaching a minor work of art when he crafted this video and placed it on YouTube. You will hear Hodges playing “Wabash Blues” with Ellington, piano; Harry Edison trumpet; Les Spann, guitar; Al Hall, bass; and Jo Jones, drums. The second piece is “Day Dream” with the Ellington orchestra. Beautiful film – and a beautiful soundtrack. Anyone who appreciates the opening sextet should check out the album that it came from, Back to Back. Recorded in 1959, the group puts its own spin on a bunch of traditional tunes, mostly blues, from the ‘20s. The entire album is as good as what you hear here. Thanks, Doug… what a nice day dream! So great to see that fine instrument in such close detail. And the experience of examining the intricate mechanical craftsmanship while hearing the beautiful music Johnny made with it made my heart beat a little faster. You can see why every inch of it is engraved… the guy just couldn’t put it down. Wonderful! And even more wonderful that Frank had it to play for so long. Wonderful piece. Thank you. I’ve wondered about that saxophone since I first saw it. I never thought I would have the chance to see the alto sax played by the great Johnny Hodges (in the words of Charlie Parker “the Lily Pons of alto sax”). It was a beautiful gift for a cold and rainy Saturday (spring Day here) at home in Rosario, Argentina. The pleasure of hearing the voice of the legendary Frank Wess, the actual owner of this magnificent instrument, is a wonderful plus. Thank you very much, Doug. And thank you very much, Tomoji Hirakata, for the very detailed video. Thanks for sharing, Doug. The horn looks amazing, I have never seen anything like it before, I love the snake head octave key. I wonder if Vito made it specially for Johnny Hodges. It’s unfortunate that the quality of Vito instruments is nowhere near nowadays. As matter of fact, I have always thought Vito only makes cheap poor quality students instruments, I wonder what happened to the company. Regardless, thanks for sharing! Without even knowing it at the time, I have heard and seen this very saxophone played twice live; once in the mid-’60s when Hodges was playing with Ellington at the legendary Lennie’s On The Turnpike, and then about 20 years later when Wess was playing with Toshiko’s band in Cambridge, MA. Had I known I was in the presence of this work of art, I would have tried to sneak in for a closer look. But at least I got to hear it! Notwithstanding all the erudite and knowledgeable comments preceding this, Bob Dorough’s song said it all, man. Omg!!! I had no idea that Johnnys’ horn was so beautiful. It does make you wonder if it was made especially for him or something he created. I am totally blown away by that horn and would rush.out and get a Vito if they were still that good. Now Frank Wess own that horn. That horn is worth so much now. The history of it now just blows the mind. From Ellington to Akiyoshi. I would also love to just hold that horn or at least see it in person. Thank you for posting this; it is something of a work of art. In the late ’70s I had the privilege of studying sax with Corky Corcoran, the former lead tenor with Harry James’ big band. He had a Leblanc tenor which was very similar to this. Also, I own a Vito Special with this alternate “Leblanc System” keywork. My Vito has a clear laquer finish with silver engraving from top to bottom.